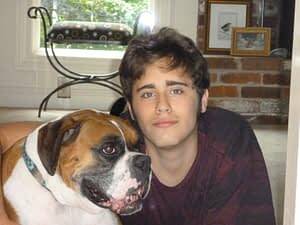 On May 21, 2014 we lost our beautiful, healthy, and active 19-year-old son Tyler to viral myocarditis. Tyler was bright and funny and was just getting his life started. Ty loved all kinds of music and was an avid bass guitar player. He enjoyed sketching manga-style cartoons and writing poetry. Tylers favorite rock groups were The Doors and Stone Temple Pilots. He was captivated by the TV series Breaking Bad, and loved to discuss the show with his many friends. At his funeral, all of his friends that spoke claimed Tyler was their best friend. On that day, Tyler had just driven home from his girlfriends house to shower and get ready for work. My wife was running errands at the time, and received a call from him to come home immediately because something was very wrong. He was panic-stricken and couldnt explain what the problem was. She found him collapsed on the bathroom floor, still conscious, but ashen gray, sweaty,and with a very faint, rapid pulse. He complained of severe chest pain and was very short of breath. An ambulance brought him to Yale New Haven Hospital and at the moment of arrival, he went into cardiac arrest. They performed CPR and were able to revive him but then he proceeded to arrest a second time. After he was revived again, the doctors performed a cardiac ultrasound, which showed what the doctors called McConnells sign and also, a massive dilation of the right ventricle of his heart. From these observations, they assumed he had a massive blood clot in his heart or lungs. They administered TPA, a clot-busting drug and waited for it to work. Tyler then coded a third time and was again brought back with CPR. This time his coloring improved and he appeared somewhat better. Despite his heart stopping three times, he regained consciousness and was still mentally intact. The nurses and doctors thought that he had responded to the medicine and they felt optimistic about his recovery. anyone could do to save our son. Our objective is to remember and honor our beloved son Tyler. We hope to raise money for the Myocarditis Foundation, to create awareness, and to educate people about this silent killer. We support the foundations goal of developing a quick and accurate diagnostic test for this disease in the hope of saving more lives.